Baseball season is back, and it begins with the launch of 2017 Topps® Baseball Series 1. Every year since 1952, The Topps Company, the exclusive trading card partner of Major League Baseball, has released its annual baseball card set that includes fan favorites, superstars, up-and-coming rookies and the recent addition of popular First Pitch™ inserts. Today, baseball fans around the world can start ripping packs and collecting cards of amazing moments, rookies and superstars. As announced last week, Chicago Cubs third baseman and 2016 NL MVP Kris Bryant was voted by fans to be on Card No. 1 for 2017 Topps Baseball. Bryant joins a long list of great players who have been represented on the first Topps card of the year from Jackie Robinson and Ted Williams to Mike Piazza and Derek Jeter. 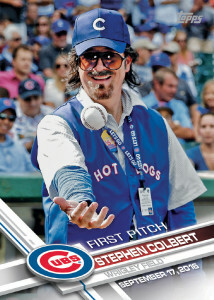 Also included in the series are special cards depicting on-air personalities from the MLB Network, including Hall of Famer John Smoltz, hosts Greg Amsinger and Lauren Shehadi, and former players Harold Reynolds, Sean Casey and more. The first 10 cards of this 29-card set will appear in 2017 Topps Baseball Series 1 and the rest within the June release of 2017 Topps Baseball Series 2 and the October release of 2017 Topps Baseball Update. Additionally, Topps is giving away two million cards in The Ultimate Card Giveaway, giving baseball fans a chance to find original Topps cards from throughout its 66-year history. There will also be opportunities to win great prizes including Topps Now™ and Topps BUNT® cards as part of The Ultimate Card Giveaway. Much of what makes baseball and Topps cards great is celebrating what happens on the field. This year’s annual release looks at memorable moments and milestones including Jackie Robinson Day, Mother’s Day, Father’s Day, Memorial Day, and special throwback nights showcasing Clubs’ classic uniforms. Topps is also honoring MLB’s award winners from 2016 with special cards made for the AL and NL Most Valuable Players, Rookies of the Year and Comeback Player of the Year, among others. Topps’s popular First Pitch™ insert cards also return, depicting newsworthy moments of celebrities throwing out first pitches prior to games. The set’s popularity has grown since its inception two years ago. Opening a pack of cards brings joy to long-time and new collectors alike. Parents and grandparents can share the thrill and excitement of a lifelong hobby with younger family members. They can also teach them about Topps’ history with special cards dedicated to 1987 Topps, featuring the memorable wood-grain design that can be found in the new packs. Topps Baseball blends its rich heritage of traditional cards with new technologies including Topps NOW, on-demand trading cards, and digital cards from Topps BUNT®, which can also be found in the BUNT app. The celebration doesn’t end there. With The Ultimate Card Giveaway, Topps is randomly inserting two million original Topps cards into packs beginning with 2017 Topps Baseball Series 1. Fans can find cards from The Ultimate Card Giveaway throughout the year in other products, including Topps Baseball® Series 2, Topps Baseball® Update, Topps Heritage® Baseball, Topps Allen & Ginter® Baseball and Bowman® Baseball. The Ultimate Card Giveaway includes a great blend of new and vintage cards, giving collectors a taste what Topps has offered throughout its 66 years of creating baseball cards. Many of the cards will include a special foil stamp to celebrate the joy of rediscovering Topps Baseball, from fabulous memories of the past to the game’s greatest moments as they happen. You can also find rookie cards of the newest rising stars, including 2015 No. 1 Draft pick Dansby Swanson, 2015 No. 2 Draft pick Alex Bregman, international star Yoan Moncada, and New York Yankees standout Aaron Judge. Don’t miss out on the thrill of opening new packs of 2017 Topps Baseball Series 1 starting Feb. 1.